Jacob Zuma, the South African President says unemployment and lack of education are the gravest threats to countering poverty in South Africa. President Zuma was delivering a keynote address during his visit to Tshwane South Further Education and Training College (FET) in Mabopane today. There are approximately 3 million young people between the ages of 18 and 24 years of age who are not in employment, education or training, representing a huge waste of human potential, said Zuma. “This, if unattended to, establishes a basis for the continuation, and possibly even the expansion, of poverty in South Africa”, asserted Zuma. 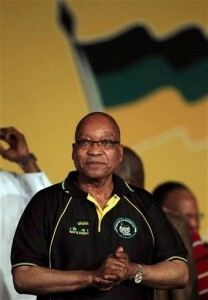 In 2009, Zuma singled out education as “a key priority area for the next five years” for the South African government. Anticipation is high surrounding the direction of the South African economy as Zuma steps up to deliver his fifth state of the nation address on Thursday. Zuma’s state of the nation address this year will be the first delivered in the context of the National Development Plan. The Presidency said in a statement that ” the president will provide an update on all key programmatic areas, especially the five priorities: education, health, creating decent work, the fight against crime, as well as rural development and land reform”. An expansion of the education and training system, leading to a skilled workforce, is an indispensable part of any viable strategy to tackle poverty, inequality and unemployment, Zuma said at the FET College. The money made available to the National Student Financial Aid Scheme (NSFAS) has more than doubled over the past years. “A total of R1.7 billion was allocated for FET College students in 2012. This amount will increase to R2 billion in 2013,” announced Zuma. Meanwhile, according to a Bloomberg Report, the South African rand swung between gains and losses before president Zuma’s state of the nation address and the release of retail sales and mining production data this week.